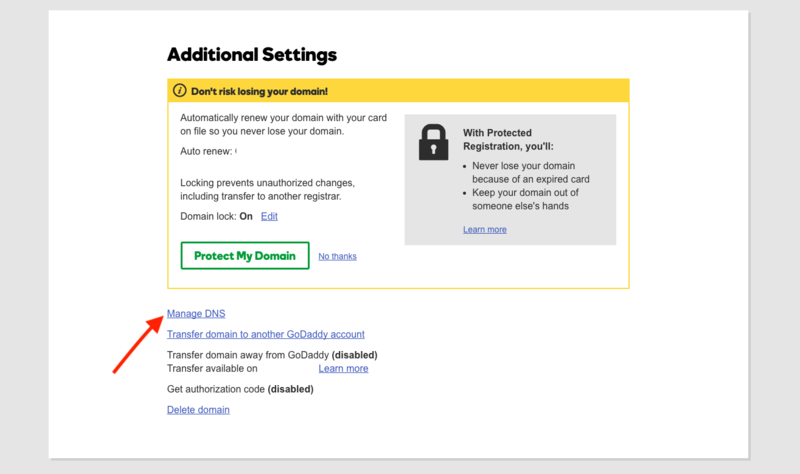 This article will help you add your domain name(s) to the B12 Design Suite and change your DNS settings in your GoDaddy account. FIRST, you will have to add your domain to the B12 Design Suite. To add your domain, log in to your B12 Design Suite, then click 'Domains' on the left side of the screen. Next, click the '+' symbol next to Custom Domain(s) to add a new domain name. Click 'Save' when you have added the domain name. Now, onto the next step! Navigate to 'My Products' in the upper-left corner and then click the 'Manage Domains' button. 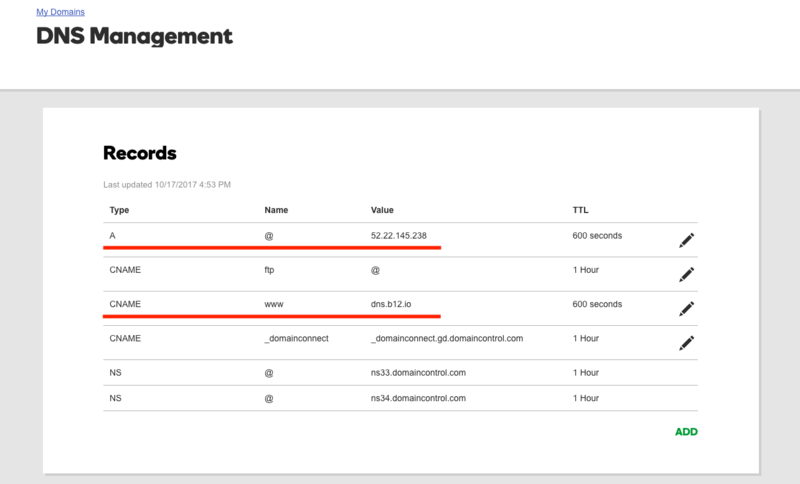 Next, find the domain you want to modify on the list and click on it to open the appropriate 'Domain Settings' page. Then, on the 'Domain Settings' page, scroll to the bottom and you will see a section labeled 'Additional Settings'. Edit the rows highlighted in red in the screenshot above. You can edit records by clicking on the pencil icon on the far right. 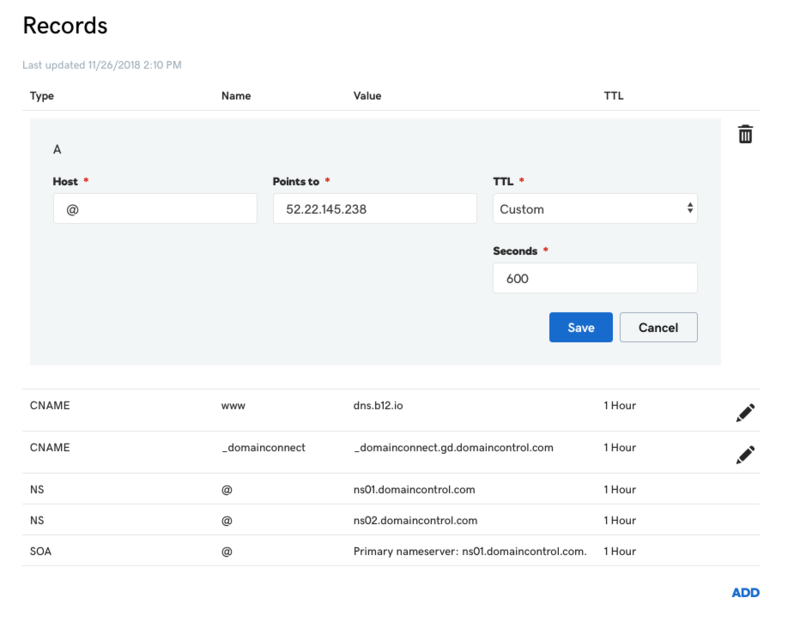 Note: If you don't see a CNAME record for www, you can just add it by clicking 'Add' on the bottom right of the Records menu. Set the TTL drop-down menu to 1 Hour. 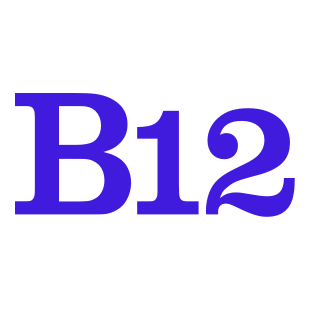 If you have any issues, please email hello@b12.io for support.